Robert Sorby have recently introduced two new lighter scrapers into their range - a 3/4in (19mm) Box Scraper and a 3/4in (19mm) Curved Scraper. In addition, and by contrast, we thought we would also re-visit a scraper from the heavier end of things by looking at an inboard bowl finishing scraper from their extra-heavy-duty range. The particular profile of this scraper is designed so that it can cut the parallel side walls of end grain boxes. In addition it has a small radius between the side cutting edge and the bottom cutting edge which allows for a smooth transition between side and bottom. 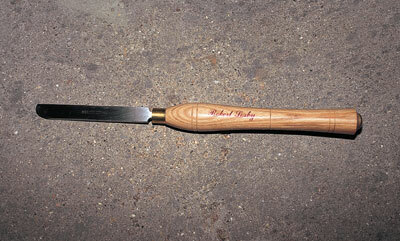 This tool is quite light and is made from 3/4in (19mm) by 1/4in (6mm) High Speed Steel. The overall length of the tool is 16in (420mm), of which 10in (254mm) is handle. I liked the balance of this tool very much as it enables you to take quite heavy cuts, but is light enough to enable very fine finishing cuts to be taken also. One of my tests with it was on a very dry piece of bubinga, from which I made a box. The profile of the tool worked very well. I was able to take fine peeling cuts down the inside of the box, and leave a smooth ridgeless finish quite easily. The small radius at the end of the tool makes it very easy to make the transition from side to bottom cutting with no problem. For cutting the bottom internally, quite aggressive cuts can be taken, and as a test of the tool I hollowed out most of the box using the Box Scraper. My only gripe is that I would like the splendid Sorby ash handle to be just two or three inches longer to give added control. All in all, I was impressed by this scraper, and for anyone who makes a lot of boxes or similar vessels, it would be a very handy tool to have around. The reference is 829H. Handled the tool costs £19, or £14 unhandled, plus VAT (ref 829). 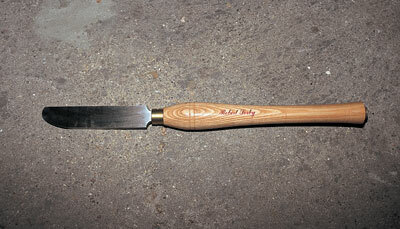 Made from the same section HSS, and with the same handle size and length as the Box Scraper, the Curved Scraper has, as its name indicates, a curved end to it. The scraper is suitable for both bowl and spindle work where smooth curves and transitions from curves to flats are required. Like the box scraper, it is capable of both quite aggressive and fine cuts. I found it very good for finishing small bowls and also for finishing the concave interior of the lid of the previously mentioned bubinga box. the same as for the Box Scraper. Both these scrapers gave a fine finish - as long as they were kept sharp - and very little final finishing was needed afterwards. 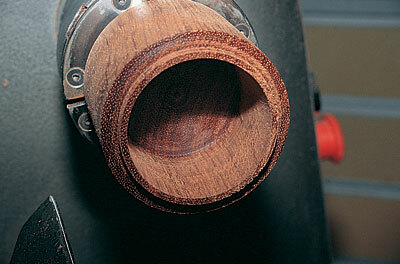 In contrast with the other two scrapers, the Extra-Heavy-Duty inboard bowl finishing scraper is quite hefty. The 7in (180mm) blade is 11/2in (38mm) wide by 3/8in (10mm) thick HSS. With a 14in (355mm) handle this gives a total tool length of 21in (535mm). This very heavy section is designed to reduce vibration and increase stability. I used this scraper on several vessels and platters and found I could take good firm cuts when required, but also very fine cuts if necessary. 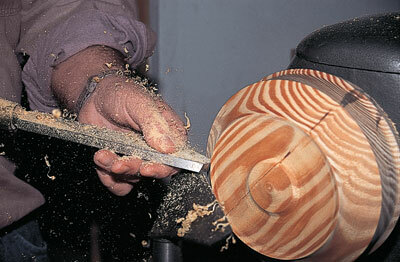 It is also very handy for undercutting bowl rims on larger work. With fine cuts and a sharp edge - so essential on scrapers - I could get a very good finish with no pull out even on softwood. I turned a bowl from a very dry piece of Scots pine which had been acting as a doorstop in my workshop for a couple of years, and got excellent finishing cuts with the heavy duty scraper. 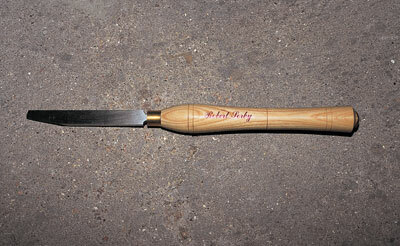 This scraper is one of a variety of profiles from the same section steel from Sorby, who also offer an Outboard Bowl Finishing, a Full Round, and Right and Left Skew Side Cut. The reference on this tool is 8008LH, and it is priced at £39.89 + VAT with the long handle, or £32.16 + VAT (ref. 8008) unhandled. This heavy-duty scraper is quite expensive, being over Â£46 including VAT, but it is a splendid tool which would clearly give very long service with seven-inches of blade to eventually grind away. 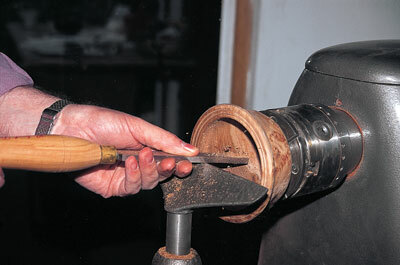 A classic turning tool. "I found the extra-heavy-duty scraper to be a delight"